It has been many years since Neptune’s first opened its doors. And 2018 sees us revitalising our establishment in Brighton Le Sands, to become the stuff of local legend. Neptune’s has a crowd-warming combination of elegant staple dishes, done with exquisite attention to detail and fresh ingredients. Along with warm and attentive service. Over the years this has garnered us many devoted regulars and reviews from Sydney-siders. Although there are always more delightful dishes for us to showcase. So come in and try our new menu. Relax in our rustic and contemporary new surroundings. Same location. Same great staff. A new and exciting culinary experience. Get ready for some real magic! Neptune’s is a generational café that has become a meeting place for families and friends for many years. This has earned the restaurant a loyal following in the local community of Brighton Le Sands. Restauranteur John Kazzi has grown Neptune’s into one of the last bastions of elegant European dining. 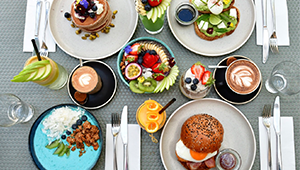 Neptune’s attracts diners from all over Sydney, who are drawn to the holy trinity of pizza, pasta and coffee – a craftsmanship that’s elevated to the highest art form here. The sophisticated, rustic and welcoming surrounds, attentive and friendly staff and community atmosphere have made Neptune’s into a charming, epicentre of life in South Sydney. A new era of Neptune’s began in 2018 with the refurbishment of the restaurant and functions room, along with a revitalised menu. It’s the same Neptune’s community vibe with a sophisticated and romantic new look. Enjoy 9 delicious plates for $55pp (minimum 4 people).